The marijuana and cocaine that CANU said they found aboard a wooden fishing boat at Mon Repos Channel, East Coast Demerara. 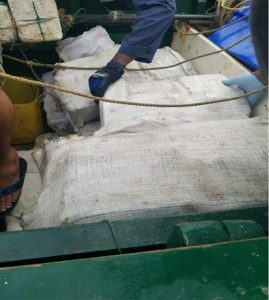 A Guyanese man and his wife were early Saturday morning arrested in connection with the interception of more than 140 kilogrammes of cocaine aboard a wooden fishing vessel near the Mon Repos channel, East Coast Demerara, the Customs Anti- Narcotics Unit (CANU) said. The law enforcement unit said the arrested suspect, Azim “Bato” Baksh, of 123 Phase 1 Goed Hope East Coast Demerara and his wife are currently in custody. 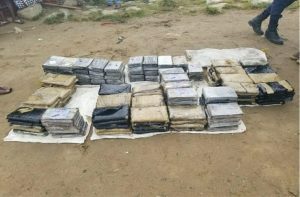 The drugs seized are 82 parcels cocaine weighing 91.132 kilogrammes and 98 parcels of marijuana weighing 56 kilogrammes. CANU said it’s agents early Saturday morning conducted an operation on the East Coast of Demerara where several locations used for docking of fishing vessels along the East Coast Sea Wall were reconnoitred and Sometime after 04:00 hours a suspected fishing vessel seen approaching a docking location at the Mon Repos Channel was eventually interdicted.